Team WeddingSutra collaborated with leading bridal jewelry brand Azva, and Veer Design Studio and Arpita Mehta, to create versatile festive looks. 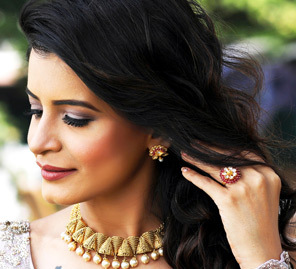 Fine gold jewellery has always been an integral part of an Indian woman’s attire. Leading jewellery brand Azva caters to the needs of contemporary women by crafting standout items that blend exquisite craftsmanship and versatility which make them suitable for different occasions and myriad looks. We collaborated with Azva to inspire your imagination with ways you can experiment with some of their pieces. 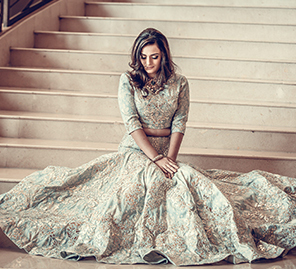 Veer Design Studio and Arpita Mehta came forward to dress bride-to-be Shika Mahnot and helped us put together unique looks for two different events. While makeup artist Johann Arora ensured that Shika looked radiant throughout the day, hairstylist Chirasree Das Gupta took care to see that her tresses were in place for every shot. Fleuron Decor created a gorgeous backdrop that enhanced the beautiful environs of Four Points by Sheraton, and KnotsbyAMP captured both the looks expertly. Your first Lakshmi Pooja is an occasion where all eyes are going to be on you, and with this beautiful necklace by Azva you’re sure to create a lasting impression. The piece features six intricate rows of beaded gold chains along with a center string made of golden 'rudrakshas' (beads). Together, the seven strands symbolize the auspicious seven vows of a Hindu wedding. The earrings, ring, and bracelet that come in this set add further lustre and complement the entire look perfectly. We teamed this jewellery set with a pink lehenga by Veer Design Studio that proved to be the perfect choice with its intricate gold motifs. Paired with a net dupatta featuring an exquisitely embroidered border, this ensemble coupled with Azva jewellery creates a charming and elegant look that is perfect for this auspicious occasion. Despite is contemporary design this necklace exudes the charm of heritage. This asymmetrical piece is crafted with textured leaves woven together to create a bold contrast to the beaded gold chain symbolizing the bond of the seven wedding vows. For our second look, we teamed this piece with a navy blue outfit by designer Arpita Mehta. On your first Karva Chauth, this fun, glamorous and young take on the traditional lehenga is all you need to look like the belle of the ball. To finish the look, slip on a ring and a bracelet by Azva, and you’re ready to celebrate in style!